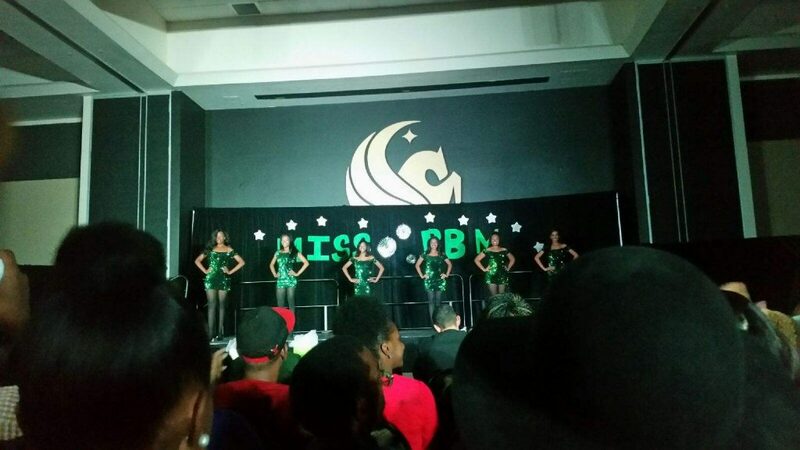 On November 9, 2016, the University of Central Florida’s chapter of Progressive Black Men Inc. (PBM) hosted their first ever Miss Progressive Black Men Inaugural Pageant. PBM is an organization on campus that aims to reduce the negative stereotypes associated with men of African descent particularly African-American men. Moreover, the organization’s mission is to empower minority communities through community service initiatives. With this in mind, the contestants of the pageant (females) each had a platform to positively impact their community. The event was hosted by Terrence Johnson and Carl Hughes. They were a charismatic bunch who kept the audience entertained throughout the evening. There was a panel of six judges which included Kensington Shields, Rachel Kennedy, Anjella Warshuis, Franklin Soares, Whitney Watkins, and Scott Soliz. The directors of the pageant were Courtney Handy and Kelsey Jay. The coordinators were Jamal Baskin, Carl Hughes, Stanley Pierre, and Robert Holland. The evening began with an introductory performance in which the candidates all joined together to do a choreographed dance to a medley of songs. Proceeding that, was the introduction of the six candidates. Candidate 2 was Annette Montgomery, a sophomore human communications major, from Miami, Florida who wants to pursue a broadcast career. Her slogan was U.N.I.T.E. children on Autism. After each candidate was introduced, the talent portion of the night was administered. Candidate 1, Ciera, performed a spoken word piece on “What Is A Queen?”. While she spoke, an artist painted a picture depicting her interpretation of the words of what a queen is. Candidate 3, Jalissa’s talent was singing Sound of Blackness’s hit song “Hold On, (Change is Coming) accompanied by members of the Gospel and Cultural Choir. After singing, she made sure to include uplifting words to persevere through difficult times. Candidate 6, Me’Nisha took a unique and spiritual take on her talent by performing a “praise dance” to a powerful uplifting gospel song. After the audience was captivated by the immense amount of talent showcased, the next sector of the pageant was the presentation of the candidate’s platforms. Candidate One’s (Ciera Cooper) platform was “Oral Hygiene Amongst Minority Youth”. She started off her proposal with shocking statistics about minority children and the relationship with the high level of teeth decay. She wants to promote oral health in minority youth by setting up community service events to educate children on oral hygiene. Candidate Two’s (Annette Montgomery) platform was “Understanding the need to Inform, Teach, and Educate children on Autism.” She plans to inform children on autism by pairing children who do not have autism with those who do in order for them to learn from each other and foster healthy relationships amongst each other. Candidate Three’s (Jalissa Neal) platform was “Domestic Violence Awareness.” She shared a personal story of how she was impacted by domestic violence through the death of her cousin. Her proposal was to start a social media campaign: #RealLoveDoesn’tHurt. Additionally, she would go to high schools to teach students and discuss domestic violence. Candidate Four’s (Leana Francois) platform was “Creativity in Education.” She would implement a two-week trial aftercare program in which students would be encouraged to actively spend time on creativity. For example, instead of a conventional after school program where children would simply watch a movie at the end of the day, she would suggest that they make up a song that highlights what they are learning in school. Candidate Five’s (Isel Bedgood) platform was “Black History in the classroom.” She wants to initiate curriculum that focuses on in-depth knowledge of black history. She feels that this will encourage minority children’s appreciation of their heritage, as well as break the foundation of racism. Candidate Six’s (Me’Nisha Jones) platform was “Juvenile Incarceration.” Her proposal is the UCF P.R.O.M.I.S.E. Act which stands for things such as “Prison Reduction Through Opportunity Mentoring and Education.” The campaign would essentially be to go to local schools, and Boys and Girls Clubs to initiate alternative recreational programs for adolescents that will prevent them from engaging in criminal activity. Once their platforms were announced, the candidates engaged in a “debate.” They were each asked questions by the judges in relation to their platform. Afterward, the candidates participated in a formal wear sector of the night. Candidate 1 wore a stunning burgundy gown with gold accents. Candidate 2 wore a glamorous mauve colored bedazzled gown. Candidate 3 wore a strapless gold-toned sequined gown. Candidate 4 wore an eccentric bubblegum pink high/low dress with large ruffles in the front. Candidate 5 wore a mesmerizing silver and red sequined dress. Last but not least, Candidate 6 wore a royal blue dress with midriff cut-outs. Finally, the winner of the evening was ready to be announced. First and foremost, the runner-up or Miss Emerald was Candidate 6, Me’Nisha Jones. However, the winner who was crowned Miss Progressive Black Men Inc. was Candidate 2, Annette Montgomery. All in all, the evening was an inspiring way to showcase intelligent, beautiful young black women attempting to make their community better through their platforms.